I predict that in the near future, costs of veterinary services will increase exponentially in order to maintain care for sick and emergent pets and major surgical procedures. As there is an ongoing decline in routine care inside veterinary clinics, smaller family-owned hospitals will lapse and close their doors. Corporate-owned hospitals will corner the market and set prices and there won’t be an independent doctor down the street to offer a more competitive price for needed services. Eventually, veterinary medicine will look like human medicine… We won’t be able to afford care for our pets without insurance, because prices will be too high. Corporations and pet insurance will dictate prices. Doctors will have protocols dictated to them by corporate entities in the interest of “the bottom line”. Your pet’s care will be directed by administrators and NOT veterinarians. Get the real scoop on CBD use in dogs! The team at RWE is keeping us righ on track with construction. Fire Dept tested our fancy new sprinklers today and I believe there may also be some flooring since I last made it over. Last weekend we had the pleasure of meeting a tremendous group of people at the Westmont Pet Promenade! It was an incredibly gusty day though I think all of us there had a great time. I especially enjoyed getting to meet clients, talking about their needs and determining how we can partner with them at Urban Vet. The other local clinics were present as well and the Drs at Village Vet and Friendly Vet were so welcoming and encouraging. The resounding message: as long as I continue to listen to pet parents, meet their needs and deliver great medicine, this dream will quickly become a successful reality. Thank you to my fellow veterinarians, trainers and the Westmont Chamber and vendors for making this event so successful! See you all in the clinic in 3 weeks! We have wrapped up all of the sheetrock and are anticipating adding some color to the walls! I was super excited to have phones and Wi-fi installed last week, so if clients want to call and get an updated open date or need information, the calls are being forwarded to my mobile so I can get back to you ASAP. I am getting excited and working through lots of little details: adding in practice management software, securing delivery of medical gas, setting up accounts with Hill's and Royal Canin to get our prescription pet food deliveries started, and any other myriad of little things. Now that we have walls going up, I look back on this photo of the kiddos playing on the concrete forms and can't believe how much open space we have managed to fill! If you want to get updates about the clinic, you can also subscribe to our Newsletter. Constuction, struction, what's your function? I was in the clinic this morning and the front doors had been removed, one door was being placed centrally, and the drywall is nearly finished! My crew from RWE Management is making spectacular process with getting all of the design, layout and functionality of the hospital in perfect order. I spent the afternoon on Monday up at the headquarters of Scil Animal Care Company in Gurnee choosing specific equipment for digital X-rays, digital dental imaging, in-house blood chemistry and hematology machines as well as a new ultrasound with color Doppler imaging. I can not wait to have new and loyal clients come through with their amazing pets and utilize all of the amazing technology we have available to help heal and prevent illness. We are looking at a rough opening date around 6/16/17! I will keep posting to keep everyone up to date on our progress! Replacing the double door with a single. We re-used part of the existing door to conserve materials and decrease waste. These are the frames for the windows and door to the ICU. This is directly off of our main treatment room, so we can keep an eye on every pet at all times while they are recovering from surgery. To the right, you can see the windows to the surgical suite. Construction was started on the building about a week and a half ago. So far all of the un-necessary walls have been taken down, a new beam "header" placed, the plumbing has been laid out and we are pouring new concrete floors this week! As each step in the process develops, I get more and more excited about the finished project. I can't wait to get into the clinic and start serving our community and getting to know everyone! As some of you already know, I went on a humanitarian mission to Tanzania, East Africa in January. The goal of our mission was to vaccinate as many dogs and cats as possible for Rabies to prevent spread to humans, especially children, thus preventing deaths due to Rabies. My team managed to vaccinate over 4,900 dogs and cats!! After 6 days in Tanzania, I suffered a brain aneurysm and subsequent stroke. I am on the way to a full recovery, but alas, this delayed our business progress just a little bit. So here is a photo of our proposed facade and hopefully we will be starting construction within the next 2 weeks! We have a finalized floor plan!!! The layout will make the visits stress free and peaceful for both pets and their people. It is great to be able to choose all of the finishes and fixtures, as if this were my home (which it will be in many ways). There are sprinklers to be installed and then construction will begin. 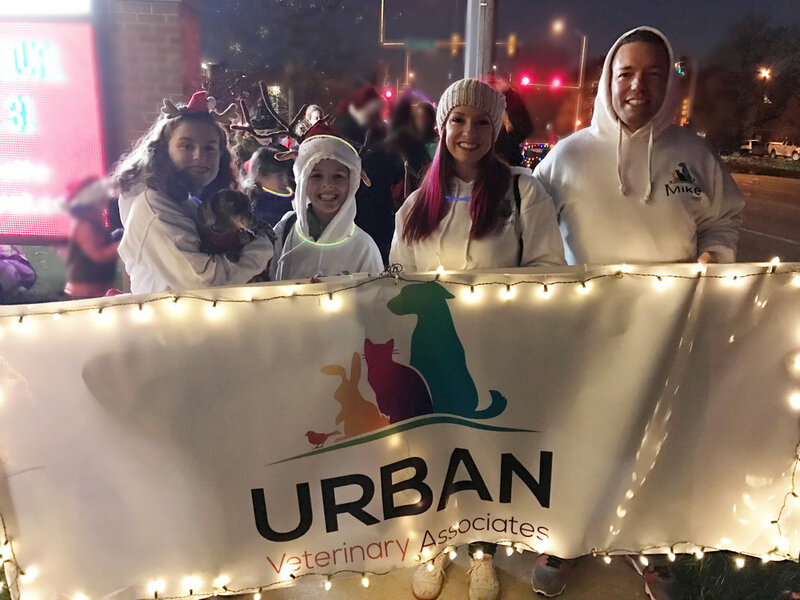 We have already been out and about in the community at the Annual Holly Days parade and we look very forward to having our family be a part of this community! We got the go ahead from the Westmont Village Board this past Thursday and are looking forward to a very bright future in the Village. As we move forward with the final floor plan, lease negotiations and permits, I am working with my Architect, Mike Matthys, at Linden Group to decide all of the details of the project going forward. There have been so many steps to get to this point and I have been dreaming of having my own hospital for nearly 10 years. All of the business owners in downtown Westmont have been incredibly supportive and encouraging, especially those right next to the hospital site. Tony Cappetta, Al Kohout and Irv Kaplan- a very special Thank You! If you have any friends or family that are looking to work in a great veterinary practice, make changes in the lives of others and maintain a great work:life balance, please have them contact me.